Bulgaria's Parliament Thursday passed on first reading a bill on the establishment of a National Agency on Security under the Council of Ministers. The vote was 129 in favour, two against and one abstention, BTA reports. The bill was moved by Mihail Mikov and Angel Naidenov MPs of Coalition for Bulgaria, Ilko Dimitrov and Mincho Spassov MPs of the Simeon II National Security, and Kassim Dal and Kamen Kostadinov MP of the Movement for Rights and Freedoms. Under the draft legislation, the Agency will be an instrument to implement the state policy for protection of national security and crime suppression and to carry out specialized operational and information activity in this sphere. The National Agency on Security will be structured on the basis of the National Security Service, which will split off from the Ministry of Interior, the Military Counterintelligence, which will be separated from the Ministry of Defence, and the Financial Intelligence Agency, which will leave the Ministry of Finance. Among other responsibilities provided for in the bill, the National Agency will carry out counter-intelligence, intelligence, operational detection, surveillance, identification, counteraction and prevention of acts against national security. The Agency will also engage in information gathering, analysis, forecasting, control, coordination and methodological guidance, using all information relevant to national security that is available from its own resources and from the rest of the state bodies. The bill proposes that in pursuit of its activities, the Agency be competent to arrange and conduct surveillance and control of persons, sites and activities related to national security, and to possess, apply and employ special surveillance means under terms and according to a procedure established by the law. The Agency is to be headed by a Chairperson, nominated by the Council of Ministers and appointed by a presidential decree for a five-year term in office. The Chairperson will be assisted by Deputy Chairpersons. clearance for access to information of the highest classification grade, are not members of political parties and organizations, and are not sole traders, managing directors or members of management or supervisory bodies of commercial corporations or cooperatives. The administration of the National Agency on Security will be organized into general directorates, a general and a specialized administration. The Agency will also have territorial directorates. Parliamentary oversight of the Agency's operation will be exercised by a National Assembly committee. When invited to do so, Agency officers will be obliged to appear before the National Assembly or the committee and provide the requested information on a "need to know" basis. 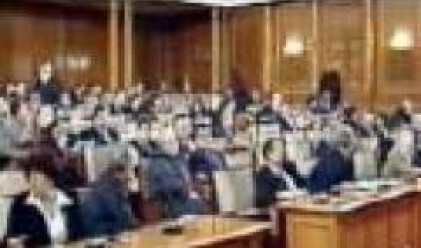 Annually, on or before March 31, the Agency will present to the National Assembly a summarized activity report.